Conchita has been wanting chicks forever. She keeps sitting on those eggs and we keep taking them away and eating them! 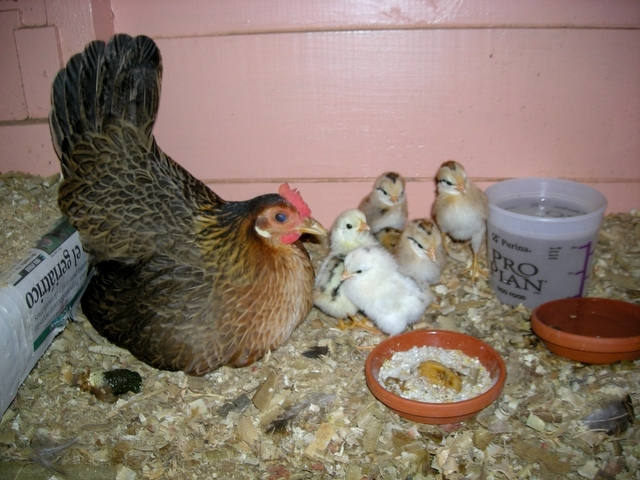 Finally we let her have six eggs and all six hatched. We've really enjoyed watching these baby chicks. It is so amazing how quickly they grow and become independent. The first time we saw them, their wings were just little nubs. Within a week they had big wings covered with long feathers. After a few days in the chicken coop, El Jefe said it was time for them to get outside. I scooped them all up in the nesting box and carried them out to the lawn, much to Conchita's dismay. Immediately, all the dogs come running to see the new squeak toys. The chihuahuas are easily intimidated by Conchita so I wasn't too worried, but when Chloe came running up licking her lips, I got nervous and put them all back in the coop. 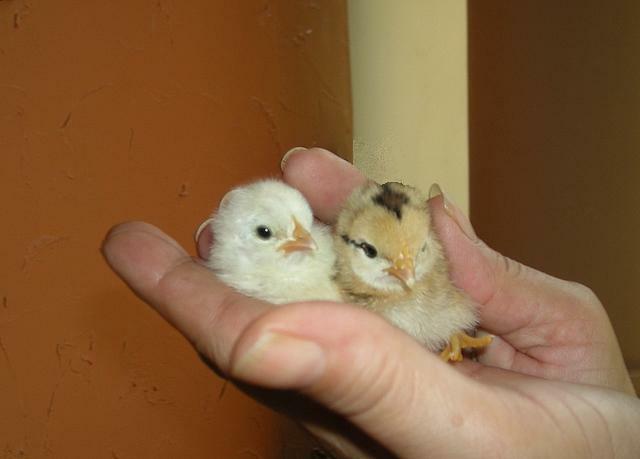 After a few days, every one was used to everyone else and Conchita was freely taking them in and out of the coop. Conchita brings them back to the coop every day about 3 p.m. and we close up the coop until morning. 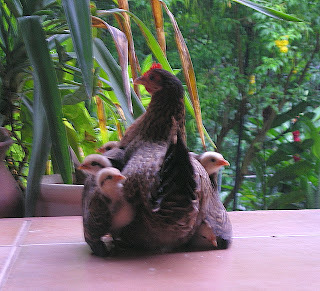 Deciding that we didn't get up early enough for her tastes, Conchita taught the chicks to jump up on the window frame and fly out the window. We had one terrible scare! One very rainy day when the chicks were only two or three days old, Conchita and the chicks didn't come back to the coop. I went out in the pouring rain to look for her but she was hiding. I even took Chloe to help me, and Chloe couldn't find them either. El Jefe searched the garden again in the rain with a flashlight when came home. No luck. It wasn't just raining − it was a tropical storm with what must have been at least 6-8 inches of cold rain that went on all evening and all night long. We could hardly sleep, worrying that the chicks would drown or get sick. The next morning, there they were! Dry, happy, and acting as if nothing had happened. I don't know where Conchita hid them but she must have found a good spot. Here is a video of their first week. I have a dilemma. A couple of weeks ago, Carlos, our former long-time worker, called to ask if we needed his wife Nora to come to work as a maid. Nora worked for us for a couple of months a few years ago. She was very pleasant and basically a hard worker but because she works fast, she didn't always do a great job. Nora, as most of the maids do, has a thing about floors. She once mopped three times in the same day! I have never in my life mopped more than once per week. She left us because she was pregnant with her third child and was having trouble keeping a babysitter for her other two children. El Jefe and I have talked about this maid thing a lot! We have really, really tried to do things the Honduran way and give someone a full time job even though we don't NEED or even particularly want a full time maid around the house. After the last one, I said, "Enough is enough! Everyone says they want a full-time job so we give it to them and then they don't come to work! From now on we will just hire someone when we NEED them." We told Carlos that we were just looking for someone once a week but when Nora came, she was so desperate for work and kept asking to come back tomorrow and tomorrow, so I said that she could work on some 'special projects' (deep cleaning) but that after a couple of weeks, the job would just be one or two days per week. Unlike most Honduran women with maids, I do the cooking, the laundry, wash the dishes, and keep the house neat between cleanings, so there just isn't that much to do. Because she was supposed to be doing detailed and sometimes heavy work and because she comes so far and the bus is expensive (relatively, for her), I was paying her a very good wage, at least 50% more than usual, but I told her that I did expect her to work a full day, none of that 9 a.m. to 2 p.m. stuff. Well, of course she came late. Of course she needed to leave early and after two days, she missed a day. She worked another two days and I mentioned that if she wanted to take a day off during the week to catch up on her laundry or her own housework, that would be fine, too. We're flexible as long as we know when she is coming and when she is not. 'No, no, no! I need to work!' she said. Because of all the rain, her husband wasn't working and they apparently didn't even have money for food. They live rent free in a house without water or electricity so food and clothes are about their only expenses. Then she missed two more days, supposedly because of her babysitter, but didn't call or anything. And, yes, poor as she is, she does have a cell phone. She didn't even give me the one-ring-and-hang-up signal to call her back on my minutes. I was annoyed. On the third day, she showed up at noon to collect her pay and to say that she can't work anymore because her babysitter moved away. Oh, why did I think it would be any different this time? Well, now it seems that Nora's cousin is staying with them and can babysit and Nora wants to come back to work again. While she is pleasant, agreeable, and basically honest, her work is not quite up to par. So my dilemma is this: Do I go through the frustration of trying to teach her how to clean things so that they are actually clean with the hope that she will continue working a few months at least? Will I feel like an idiot for trying again for the umpteenth time when she decides after two weeks that she doesn't really want to work? I'm not sure if it was puppies or chickens. 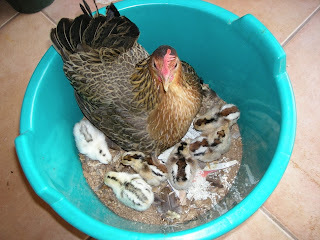 This video of Conchita and her chicks was taken during their first week. 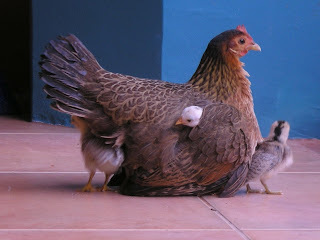 We had really cold and rainy weather and the chicks had the perfect spot to stay warm and cozy. 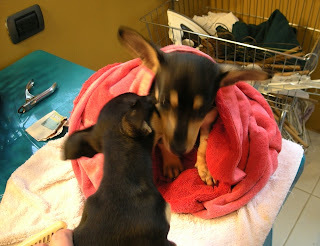 They are five weeks old now and are still hiding under Conchita. This photo below is my favorite even though it is blurry. All six chicks are in there though you can only see five peeking out. I call this an elephant (ear) stampede! 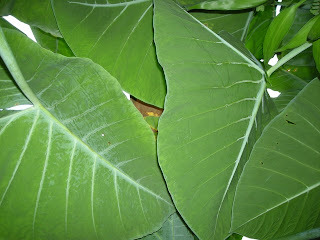 I planted none of these Elephant Ears in this spot. 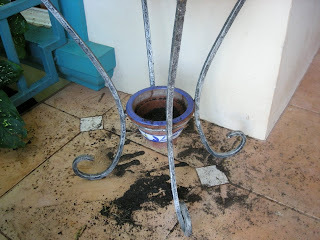 We had one plant which became several in a concrete jardinera (planter box) outside the terraza. Now we have them in several spots and I usually have to remove them because they crowd out everything else. This plant spreads like crazy from roots, but this clump must have spread by seeds because the roots would have had to travel 3 feet (1 meter) down under the concrete wall and foundation and another 8-9 feet (2 meters) under the lawn to get to this spot. 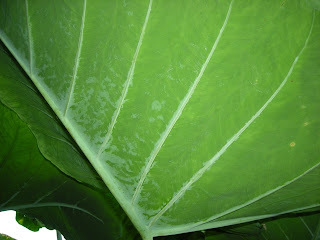 This may be a Xanthosoma but there are so many similar plants. 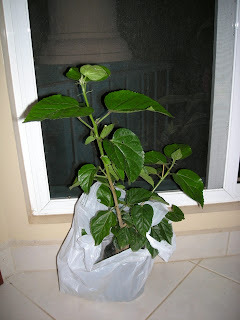 It develops a tuberous vegetable which is called malanga here in Honduras. Malanga is a little like a potato but has a gummy consistency reminiscent of Elmer's glue. We gave some to a worker once and he brought some back cooked for me to try. It was okay, but I'd rather have a potato. 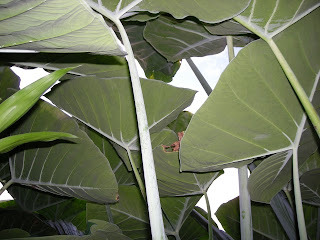 I chuckled when I read in Wikipedia that the Polynesians consider it a 'famine food' and inferior to Colocasia, commonly called Taro. Maybe I would like it better in a different recipe rather than just boiled. 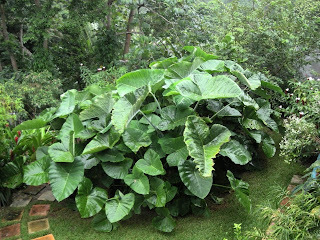 I also don't know when this plant produces the tubers because whenever I've suggested to the workers that they dig some up and take the malanga home, they never find any. 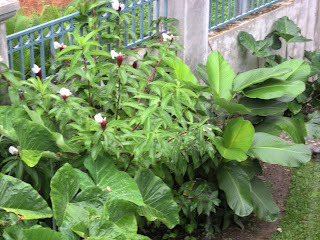 Maybe the plants are too old or the tubers rot away during the rainy season. Oh, well. For me this is best used as a decorative plant, but it is hard to keep those elephants under control. Chloe has been itching herself to death! She scratches, bites, and chews on every part of her body that she can reach, but most especially her feet. The other day we awoke to find that Chloe was walking on three legs and in a lot of pain. Examining her foot, we found that the bottom part between her toes looked like raw meat and was infected. I didn't see any indication of a cut so I think she caused it herself. I cleaned it with peroxide and applied Trigentax which I've found to be a miracle cure for infected cuts and so forth (for humans). I put a gauze bandage pad between her toes and the pads of her feet to cover the ointment so she wouldn't just lick it off. Stumped as to how to bandage it so she would leave it alone long enough to heal and limited by the contents of my first aid kit, I finally wrapped her foot and ankle with a worn out (not stretchy) ... whatchamacallit (Man! English words are escaping me lately − it's scary!). You know, the thing that you might wrap a sprained ankle with. Then I covered the whole thing with bandage tape to keep it dry and most of all, to prevent her from chewing off the bandage. Although Chloe did not like the cleaning part − it hurt! − she was amazingly good about the whole thing. I think she knew we were trying to help her and she actually seemed kind of proud of her bandage. I repeated all that the next day with a clean bandage. Wow! That ointment is incredible. 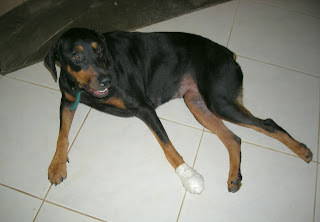 By the third day, Chloe chewed off the bandage and her foot was healed. La Doctora Gringa saves the day again. Now, I just wish I could figure out what is making some of these dogs itch so much. Chloe and Uno both have a red rash on their underparts. 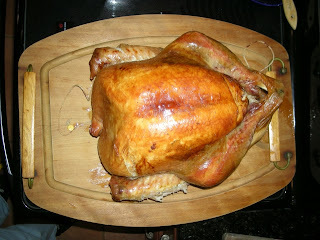 Pavo (turkey) done to perfection! Thanksgiving was fantastico. 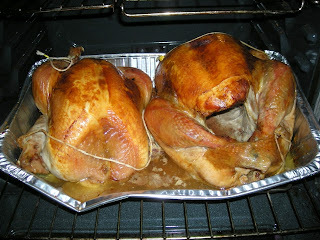 The turkeys turned out great even though they took an extra hour − a result of my opening the oven to baste too many times, I suppose. Thankfully, the oven cooperated and didn't "go off" during the turkey roasting as it did FOUR! 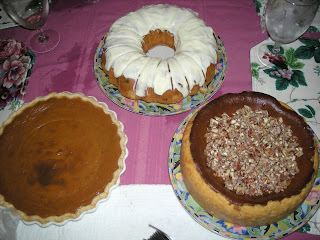 times the day before while I was baking the cheesecake and pumpkin pie − hence the charring on the tops of the desserts. Most of the guests were an hour late as well, so that was a lucky coincidence. Apparently El Jefe has lectured them about 'American time' for parties so many times that they are usually right here right on the dot. We had twelve people − exactly the number that comfortably fit around our dining room table with all the leaves − another lucky coincidence. In Honduras, you never really know if someone (or more than one) extra will show up. 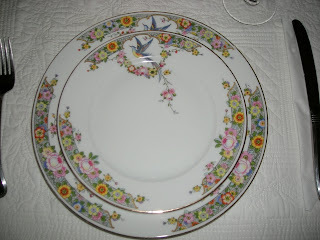 The 100-year-old antique china came out of hiding for the occasion, too. I just happen to have a service for 12 más o menos (more or less). The family was incredulous that it could be that old. I don't think I've ever been thanked and complimented so many times. We talked a little about the Thanksgiving tradition. They got right into the American tradition and ate until they could eat no more. This year, they even liked the cranberry sauce and stuffing! I actually ran out of stuffing. All but the youngest one 'cleaned their plates' and almost everyone sampled two or three desserts. We also did the wish thing with the wishbones and everyone laughed at that. Brother-in-law M wanted to know, "Who decreed Thanksgiving?" which I thought was an odd question, as if someone sometime had decreed that we must give thanks. He seemed impressed with the idea that Thanksgiving was celebrated before there even was a United States of America or a government to decree it, and even more so that it was celebrated with the indios (indians) to give thanks for the harvest. After dinner conversation included corruption, my favorite topic! Que lastima (what a shame) that I was too busy doing woman's work to participate, but if you want to know the truth, the women usually don't get involved with those kind of topics, so maybe it was for the best. I did hear brother-in-law J (who has been around the world for the past 10 years as a pilot on a cruise ship) say that he thinks that corruption has gotten worse in Honduras than anywhere he has been. 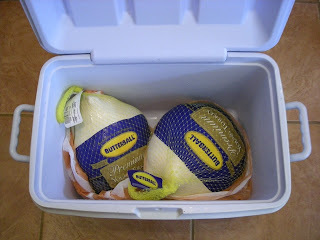 As I'm sure most of you guessed the other day, we didn't need two turkeys. Oh, well. We gave half a turkey to my sister-in-law B and still have about half a turkey leftover. I'm debating what to do with the leftovers besides my favorite: cold turkey sandwiches. I also gave one of the carcasses to B for soup. ;-) I debated long and hard about offering it. It does make a great broth but on the other hand, offering someone the bones is kind of weird and could be taken the wrong way! B brought me a present. I've wanted an orange hibiscus for a long time and have gotten cuttings from her plant and others but hadn't had any success in rooting them. I mentioned to her a couple of months ago that I wanted one, so she said she would root it for me. I looks great. I just hope that I don't kill it. I forgot to ask B about teaching me to make tamales but now I have an idea to get her over so she can teach me to make tamales while I teach her to make bread. 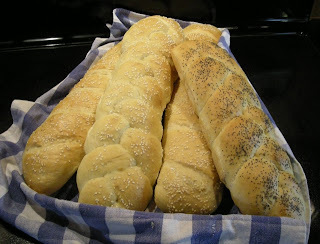 Her family loves my bread and El Jefe says that she wants to learn how to make it. The day after Thanksgiving, I could hardly move. My back was killing me! I guess from being on my feet for most of three long days, not to mention scrubbing floors on my hands and knees. I'm feeling better today. All the hard work was worth it because we all had a very nice time. I have no time to write today but I wanted to wish everyone a Happy Thanksgiving! Ha, ha, ha! That's my lame attempt at poetry. We're having the BIG family over for a traditional American-style Thanksgiving dinner. Last week none of the stores had turkeys. We meant to go shopping last weekend, but....I don't know what happened. Procrastination, I guess. We (me in particular) are famous for it. Then Monday slipped away, too. I made homemade bread and stuck it in the freezer but that was about it. So yesterday, while I was slaving away cleaning house, El Jefe went shopping with my second grocery list. 'Second' grocery list? The puppies ate the first one. It was actually a pared down list as I was trying to concentrate on the basics and the things that his family likes. For example, the first year that I made Thanksgiving dinner for them, some of the family only ate turkey and pushed everything else around the plate like it was poison. In fact, one nephew leaned over and told me if he had to eat one more bite of sweet potatoes, he was going to vomit. Ah! Just what a cook wants to hear. 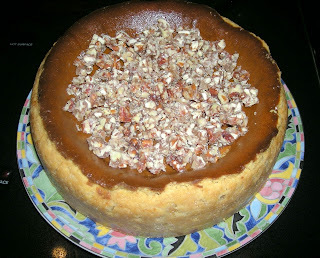 They didn't seem to like the pumpkin pie so much, so I'm making a pumpkin cheesecake for them and a pumpkin pie for us. Soon after he left, El Jefe called to tell me that the first store only had 10 pound turkeys. Ten pound turkeys?! I didn't even know they came that small. My three brothers-in-law could demolish a 10 pound turkey by themselves. 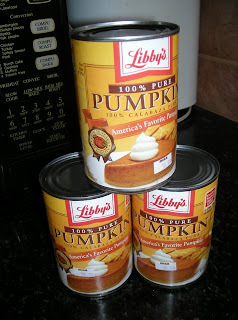 Canned pumpkin? What is that? Stuffing mix? He found 6 oz. Stove Top and that was it. Okay, no problem, I can toast and cube the bread myself. Butternut squash? Nope. (I had planned to make a Butternut Squash soup that is to die for − I'll give you the recipe sometime.) Well, I always make too much food anyway. No soup entrada. Cranberry sauce? What is that? Graham cracker crusts...or graham cracker crust mix...or plain graham crackers? No one had a clue what or where they were, even though I'll bet $100 that I see one or all of these the next time I go to the store because I HAVE seen them in the stores many times. Oh well, scratch the key lime pie. I had three backup desserts in mind, depending upon what ingredients were available. Real butter? One clerk suggested that a package of cheddar cheese might work instead. Come on! Mantequilla amarilla is Spanish for real butter and the clerks don't know what it is? How about a little training here? It's not like I'm asking for pâté de foie gras or something exotic! With every phone call, and there were many, I continued to adjust the menu. 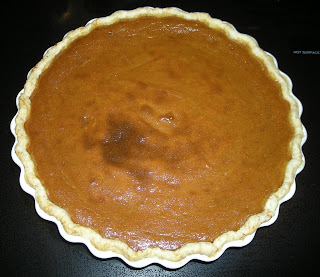 After that last call suggesting that I make pie crust with cheddar cheese, as I sat dejected after hanging up, I seriously considered throwing my phone through the window. After hitting every store in town and coming home with frost-bitten fingers from searching the piles of turkeys, El Jefe came home with a 17-pound turkey, the largest in La Ceiba. We looked at it, thinking "Well.....it may be enough, but then we wouldn't have leftovers for turkey sandwiches." So he went back and bought another small turkey as well. Gotta go! 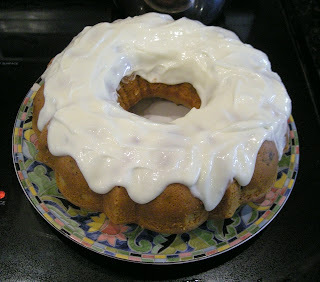 Today I'm making the desserts and finishing cleaning the house. Wish me luck! By the way, you could eat off my kitchen floor. Our Sunday was spent giving six dog baths, clipping 90 toenails (thankfully, Chloe the Rottweiler doesn't require toenail clipping), and cleaning 12 dog ears. Wow. What fun. Not! 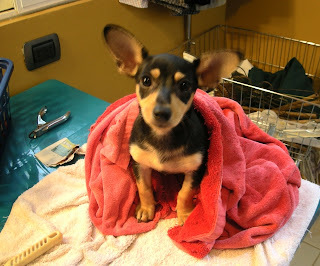 − since most of the dogs do not like having baths or having their toenails clipped or their ears cleaned. Oso (the bear) wrapped in the towel above was the one exception. This calm little pup will let us do anything to him without complaining. He is truly a teddy bear. I took about a dozen photos and all but one turned out blurry like this one. 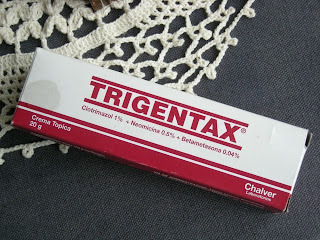 I wasn't going to talk about this, but the day was also spent finding and killing about 587 ticks. Disgusting! Man! Ticks are a problem here! And we haven't found any good solution. At that time, I was removing up to 175 ticks PER DAY from my two little Shih Tzus (who have since gone to doggy heaven), so I was desperate enough to dispense with my organic mantra to try it. Not only did I worry myself sick about the chemical effect on the dogs, the chemical didn't have much effect and I wasn't about to spend my life dousing my dogs and gardens in a dangerous chemical. So now we try to keep the ticks under control by checking the dogs, washing their bedding, and cleaning their 'hang outs' frequently, but it is a constant struggle. I was wondering if anyone has any tips for natural control? While reading my friend Andee's Gardener in Chacala, Mexico blog, I read mention of the Garden Blogger's Retro Carnival and checked it out. 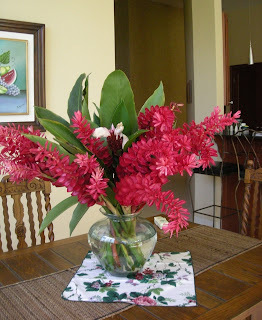 Before I go on to that, though, I want to recommend that anyone interested in tropical plants and flowers, whether you are living in Central America or elsewhere, check out Andee's blog. She has the most incredibly beautiful garden photos. Sue at the Balcony Garden from Milan, Italy (who incidentally is on my feed reader − I'm just terribly behind in reading blogs) came up with the idea for a "Retro Carnival" in which bloggers could offer up to readers an older gardening article that they might want to take a look at. Since my gardening related articles have been so few and far between lately, I've probably lost most of my gardening readers! I may be too late for the official Carnival, but if you are new to the blogicito and haven't seen this article before, you might want to take a look at Why do they have to get so big?, which was my first article to be published on Garden Voices. My idea was that it would be all dug out, the soil renovated with compost, and that the huge clumps would be replaced with one or two the plants to give us another year or so with less maintenance/pruning. The worker understood at first, but apparently got 'machete-happy' when he started chopping up the plants. When I asked where were the plants to be replanted, he said that he had chopped them all up and put them in the compost pile! I managed to retrieve two mangled plants and replanted them. I found that I really missed those huge greyish-green displays and I'm glad to say that they are finally recovering. This photo was taken yesterday, showing a much smaller clump of the Calathea. 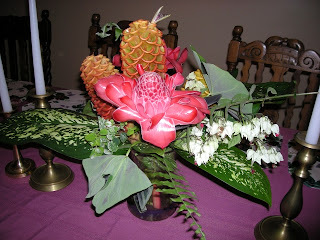 I'm not sure if the worker planted the Costus by mistake or if it was a volunteer from the compost pile. 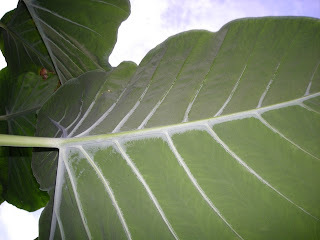 I learned more about Calathea lutea from Mary at Neotropical Savannah in Panama that the leaves can be used for wrapping tamales, which I'm hoping to learn to make this year. I'll let you know how that goes, too. I liked this Honduran music video by El Cleix even though it is rap or reggaetón, or maybe even hip hop (? ), none of which I usually care for. I like most Latina music but I'm more the Bachata type. Interesting that some of the comments at YouTube mentioned the spelling errors in the video because that just points out that the education system is not what it should be. Another thing that is ironic is that if this 23-year-old Honduran artist were to release a CD, it would be immediately pirated by his compatriots and sold on the street for L.40 (US $2.12). It's hard to get ahead in Honduras no matter how talented you are. During the five days that he was a fugitive from justice, Marcelo Chimirri, head of the Honduran state-owned telephone company, says that God has touched his life. He has requested a month leave of absence from Hondutel from President Mel Zelaya so that he may spend time with his family and consider his political aspirations. He hasn't ruled out the possibility of running for president of Honduras since he has seen the support of Liberal party members since his return. Never mind that the constitution of Honduras states that candidates for President have to be Hondurans by birth. Anything is possible in Honduras. The constitution was reinterpreted in 2001 in order to allow former President Ricardo Maduro, born in Panama to Panamanian born parents, to run for president. According to this 2000 Honduras This Week Online article "Nationalities of candidates questioned" (halfway down the page), it seems that Honduras frequently has problems finding Hondurans by birth to run for president. In regard to the raid of Chimirri's home, President Zelaya stated, "....that was really a total abuse of the authority in the sense of entering with disproportionate, brutal force the residence of a public official and at the same time to offend the dignity of his daughters, his wife and in his absence". He has also encouraged Chimirri to file a complaint with the Human Rights Commission. Chimirri has called the Minister of Security a savage and says that the police put guns to the head of his 3- and 7-year-old daughters. Reader Mane tipped me off to this latest transformation. You can read Mane's scintillating and very depressing comments at the end of the article here. Mane knows the ins and outs of Honduran politics. I have no doubt about that, but this was just so far fetched that I had to check the online editions of the newspapers. Silly me. I keep forgetting that TIH − This is Honduras! Well, there is more in the referenced newspaper articles (in Spanish), but right now, I think I'm going to be sick, so I'll just leave you with this short video of Chimirri celebrating. If you are new to the tales of Marcelo Chimirri and the swamp of corruption in Hondutel, you can see all the articles here. Marcelo Chimirri's future is looking brighter. The head of the state-owned telephone company disappeared after his home and office were raided by government officials last Friday morning. Calling in to a Honduran radio show that same day, he expressed his outrage and indicated that he would resign from his government position. Chimirri also stated to the media that if he had been at home, he would have used gunfire against the authorities to defend his family. He most recently has been accused of abuse of authority and telephonic espionage. The wiretapping charges relate to 12 taped telephone conversations between President Mel Zelaya, other high level functionaries of the Honduran government, and Chimirri, which have since been posted on YouTube by user JuanaPueblo. Prior accusations have included involvement with grey traffic, unwarranted raids of businesses and illegal confiscation of their equipment, acceptance of bribes, sexual abuse of Hondutel employees, and threats and assault of news reporters. He reportedly still is considered a person of interest in the 1998 death of his former girlfriend, Yadira Miguel Mejía. The Arcadia report charged that Chimirri's "personal wealth has increased substantially in a very short period without the benefit of a parallel growth in visible and legitimate earnings." In addition to threatening and physically attacking members of the media, Chimirri also has filed multi-million dollar lawsuits against several reporters and newspapers in an effort to intimidate the Honduran media. President Zelaya has had a longstanding bad relationship with the media. An outspoken radio journalist was recently murdered and other members of the media have left the country in fear of their lives. Authorities attempted to take him into custody in La Ceiba on Friday, where he was visiting on business, but he couldn't be found. They searched for him for days and speculation was variously that he and his bodyguards had left the country, had taken refuge in the Honduran Presidential Palace, or that he had taken asylum in the Italian Embassy, since he is also an Italian citizen. Word from his attorney was that he would turn himself in on Monday − it never happened and neither did his resignation. In the course of the hunt for Chimirri, authorities searched a luxury La Ceiba hotel and detained various bodyguards and four attractive young Colombian ladies wearing short shorts, ages 19-24, who claimed to be Chimirri's security team. Illegal arms were confiscated from these people, his home, and the hotel room where he and/or his "security team" were staying. Things began to look brighter for him (and sadder for the country of Honduras) when President Mel Zelaya returned from Chile. In press conferences, President Zelaya says that he will not comment on the case until he gets the report from the Fiscalía (District Attorney) AND hears Chimirri's side of the story. But in the meantime, Mel Zelaya has expressed his outrage at not being informed in advance of the planned raid on his "close friend" and "political campaign supporter", accusing the Minister of Security of wasting the time of 200 officers with this when he should be tracking down drug traffickers. Ironically, Zelaya personally filed the denuncia (official complaint) regarding the taped conversations and was reported to say that he wanted the persons responsible prosecuted and jailed. 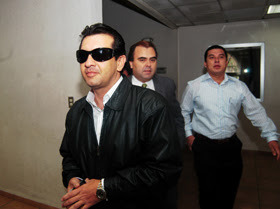 President Zelaya qualified the raid as a brutal assault, even though officials stated that all procedures were performed in accordance with the law and that there were only 15 officers involved in the raid of Chimirri's house. 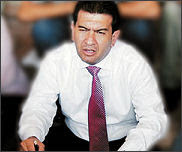 Zelaya suggested that authorities merely needed to have sent Chimirri a note and he would have presented himself − a little disingenuous since Chimirri was missing in action for five days, knowing full well that the authorities were searching for him. Today, after five days as a fugitive, he has turned himself in. He stated that he had not responded to the judges because he had other matters to attend to. 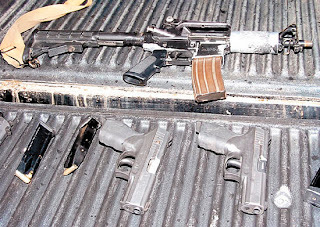 In regard to the illegal weapons charge, he stated that they were the property of Hondutel, not his. After meeting with the judges today, he has been released with the provision that he report to the court every Tuesday and not leave the country. Meanwhile, the other two Hondutel executives charged also have been released by the judges under substitute measures. While they are forbidden to return to work at Hondutel during the judicial process, apparently Marcelo Chimirri will be under no such restriction. The judge threw out the charge of violation and revelation of secrets, saying it was a private, not public matter. The initial hearings on the charges of abuse of authority and illegal weapons are scheduled to begin on December 5. Hondutel employees abandoned their work today to protest in support of Chimirri to pressure the judges to release him. Liberal political party members are saying "To attack Chimirri is to attack the Liberal party." After a few days of excitement, it's back to business as usual in Honduras, where the poor go to jail while the rich and powerful sit back and laugh at the judicial system. 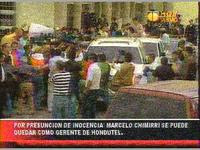 More information on Chimirri and the Honduras grey traffic scandal and other escapades of Chimirri can be found here. The articles include links to several newspaper articles. Photos: La Prensa, El Heraldo, La Tribuna, links included above. 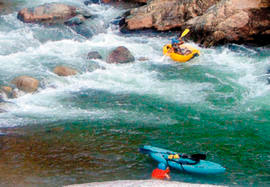 In a tragic accident on Sunday afternoon, a 52-year-old North American tourist drowned while river rafting on the Rio Cangrejal with a tour company. The man's name was Eric Simons and the newspaper reported that he was from Colorado, Illinois, but that has since been corrected by reader to be Boulder, Colorado. I imagine that the river is high and rough since we have had a lot of rain lately. I've read that the rapids range from level I to level IV, depending upon the location in the river and the time of year. Also, from reading lots of travelogues, I know that rough and wild is exactly the type of river rafting trip that many people are looking for. Yesterday's noon news reported that he fell out of the raft and that the guide tried to rescue him but the man panicked and almost drowned the guide as well. His body was recovered some two kilometers down the river. News of any tourists accidents is always bad news for tourism. People will remember this one man who drowned long after they have forgotten the tens (or hundreds?) of thousands of people who had a wonderful experience on the Rio Cangrejal. Police authorities "launched a call to tour operators to avoid more human loss in the rainy season," whatever that means. Based on the names reported, I believe that this was the very same guide that I used in my long ago river rafting trip and the owner of the tour company, who also joined our rafting group, was on the trip as well. They have been operating for many years in La Ceiba. If you have been reading this blogicito for very long, then you know that if I thought (in my not so humble opinion) that the guides took unreasonable risks or that if the equipment was substandard or that proper precautions were not taken, I would tell you. My opinion is actually quite the opposite. Although I'm a good swimmer, not being a particularly brave or adventuresome person (except with words), I didn't even plan to go down the river. I paid my fee for the trip but I was going to follow along with the driver and take photos, which I was perfectly happy and content to do. The guides begged and encouraged me to take the raft instead because they wanted me to have fun. I finally relented. I don't remember all the details, but we were required to wear a helmet and life vest, and we spent the first 15-30 minutes learning safety measures, including what to do if we fell out of the raft or if it overturned. It wasn't just talking; we had to practice floating feet first down the river. The guides spoke excellent English and there were no communication problems. During one part of the trip, we stopped and climbed up a mountain through the jungle to swim in a secluded pool formed from the rocks. It wasn't easy climbing (for me) and at one point, I slipped and scraped my leg. It was no big deal − more injury to my pride than anything − but the guides insisted upon stopping, pulling out their first aid kit and doctoring up my shin. After that, one of the guides stayed close, grabbing my arm whenever my feet slipped on the muddy earth. I felt perfectly secure with the guides. I never doubted my safety with them. I thought they were extremely well trained and knowledgeable. I believe that they gear their trips based on the experience and wishes of the customer. The other reason I brought this up was to talk about cultural differences. During the news report, in an interview with the forensic doctor, he stated the man's age three times and twice went into a long discussion of how this was a sport for young people 20-22-25 years old, not for old people. My mouth fell open listening to this. I was shocked to hear the doctor proclaim that a 52-year-old shouldn't be river rafting and I imagine that those of you who run a marathon at 60 years old or are in your 50's and 60's and are in better shape than many others who are in their 20's are amazed to hear that, too. I didn't know Eric Simons and have no information about his physical condition or what kind of rafting trip he asked for. It was a tragic accident, but I think it was just that, an accident, and that only the forces of the river are to blame, not the tour operators or guides or Mr. Simons himself. My condolences go to Eric Simons' family. 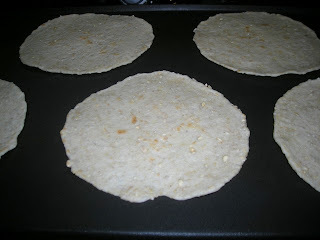 I really like to make tortillas substituting a cup or so of whole wheat flour for white. The whole wheat adds a nice flavor change. I haven't been able to find whole wheat flour for a long time, but I've since been informed that Paiz is carrying it. I guess that I just gave up looking for it and didn't notice when they started selling it. That happens sometimes. I just forget about the things that I used to miss. 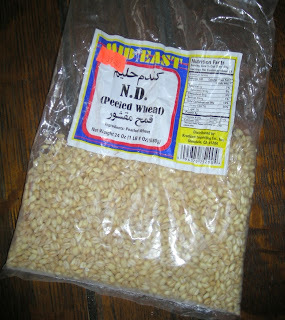 I recently found this packaged "peeled" wheat at one of the import stores that seems to have a big selection of Middle Eastern food now. I bought it not having any idea of what I would do with it just because I really miss having whole grains. I had never heard of peeled wheat. Last Friday when I was making tortillas for my Tex-Mex guests, I wondered if I could make whole wheat flour by grinding these wheat berries. I ground them up in the coffee grinder leaving some of the pieces a little chunky. I used my same tortilla recipe, just substituting one cup of ground peeled wheat berries for one of the cups of white flour. The tortillas received a lot of compliments, both from the gringos and Hondurans. El Jefe liked them a lot. 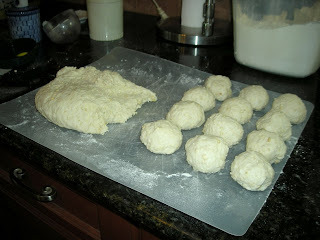 If you are interested in trying to make tortillas, don't let the length of that article scare you off. I wrote it in the Julia Child style, i.e., five pages for French bread. When I'm making something I haven't made or maybe even haven't seen made before, I find it very helpful to have detailed instructions and step-by-step photos, so that is what I did. 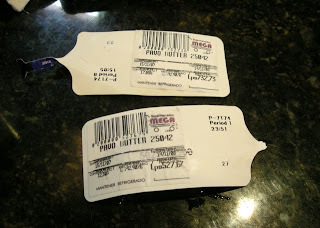 By the way, I recently showed a Hondureña how I form the tortillas using two sheets of plastic. Her eyes got big and she said, "What a good idea! I form them on a plate but it is much easier this way!" Na-na-na-nah! How is the weather in La Ceiba right now? It is sock weather! 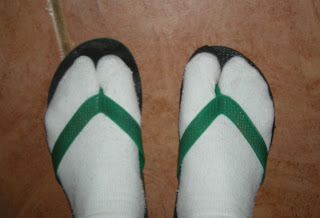 Socks and flip-flops. That says something about my fashion sense, doesn't it? (Don't worry, Fashion Fabi, I don't wear them out of the house.) One day, I even wore my sweat pants. For the past two weeks, we've been in a frente frio (cold front), with lots of rain and chilly weather. 'Chilly' is relative, but when you are used to 86°F (30° and sunny skies, this weather seems downright cold to me. We love it at night and have been sleeping better and longer under the soft down comforter (no gecko eggs this time) and with no bright sun shining in the windows to wake us up in the morning. My thermometer is showing temperatures in the 75°F (24°C) range with 97-99% humidity inside the house most days and low 70's (21ish) at night. The sun peeks out occasionally but it has been interspersed with rain most days. We alternate between opening the windows for fresh air and rushing around to close them from the rain, sometimes three or four times a day. A few years ago, I would have been thinking the same thing you are thinking right now, "How ridiculous to say 75°F is chilly weather!" I don't know if it the effect of the extremely high humidity or that I have adjusted to the hot weather, but I can honestly say that I have felt cold. Generally, in La Ceiba we experience one or two weeks of chilly, very rainy weather in late December or January, so this lengthy cold front seems earlier than usual. Just curious, I checked my articles for this time last year and I was saying the same thing in 2006 − that we had an unusual November cold front, so maybe the climate is changing. I also noticed that on October 19th, 2006, I was complaining about how hot the weather was. Heheheh. Click on "weather" under the "Topics" heading in the sidebar to read all of my weather articles, where I sound like Goldilocks saying, "It's too hot. It's too cold. It's just right." Heheheh, again. For general, slightly more factual information about La Ceiba weather, see "How is the weather in La Ceiba?" The rain can get tiresome, especially when you have six dogs, but overall, we've really been enjoying the change of seasons! 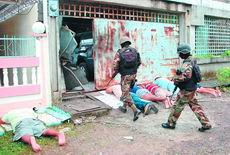 Newspaper reports on Friday stated that a total of 15 raids were effected in different parts of the city beginning in the early hours of the morning Thursday. 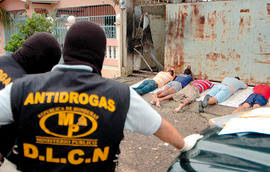 Approximately 300 anti-drug agents, fiscales, judges, and military personnel participated in the operatives. In addition to La Gringa's neighborhood, blogger Katrina's apartment building, restaurants, the harbor, and other "tourist places" were also the subject of raids. Apparently only six people were taken into custody which sounds like a disappointing result to me. The name of the 30-year-old man who was killed was released: Franklin Cunningham James (sounds like a gringo name to me), who said he was captain of a fishing boat. He was from Nicaragua where he is had a criminal record for narcotrafficking and was operating out of the La Mosquitia area. He died after being taken to the public hospital with two bullets in his body. Another man was injured (or depending upon the newspaper reports, six people were injured). Explosives were used to gain entry in more than one home and at least five nearby homes were damaged as a result. A press conference was promised for the afternoon Thursday but never materialized. The media was left in the dark as far as whether there was confiscation of drugs or money or whether the suspects were charged with narcotrafficking or money laundering. Names of the homeowners or renters were not released. I believe that if they had found quantities of drugs or money, we would have seen the evidence on the news. Apparently, (as suggested by the taxi driver!) the local police and fiscalia were left out of the loop in this investigation due to corruption in prior cases. 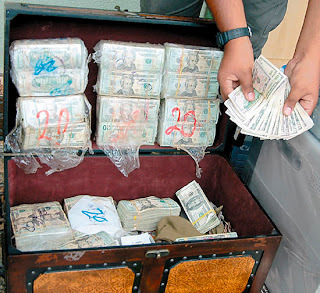 La Prensa reported that L.6 million in cash (US $317,460) was found hidden in cowboy boots, cloth sacks, and cabinets. 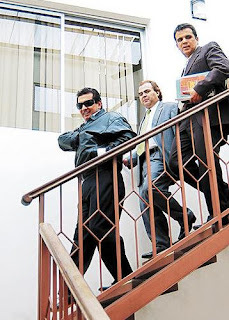 The Fiscalía Contra el Crimen Organizada (state attorney in charge of organized crime) reported that no drugs were found although there was indications of money laundering. 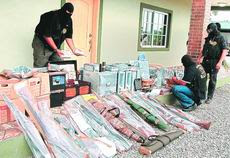 Also decommissioned were a quantity of high caliber firearms, prohibited munitions, and half a kilo of TNT explosive. Investigators also took custody of numerous computers, 18 vehicles, some motorcycles. The homes and businesses remain under the control of the authorities while waiting a resolution from the Office of Bienes Incautadas (seized property).